Madison County is well known for its covered bridges. The Madison County Chamber of Commerce can direct you to the bridges that are still standing. Many of the others have been replaced over the years with modern bridges. What did they look like when they were newly built in the nineteenth century? The photos in this section show the bridges when they were in ordinary part of daily transportation from farm to market, rather than sites for tourist visits or film sets. The photos are from Madison County: Images from Our Past, and are reproduced by kind permission of the Madison County Historical Museum. Thanks to Wendell Spencer, curator of the museum, for his help. 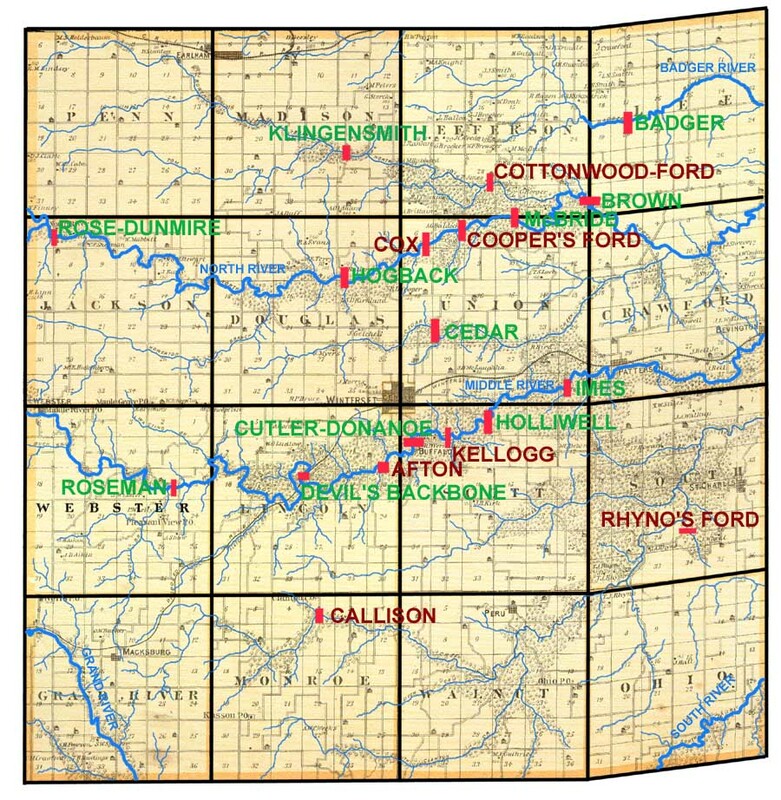 The map below shows the approximate locations of the original bridges, most of which were named after the family living closest to the bridge when it was constructed. Click on the green bridge names to see a photo. You are the [an error occurred while processing this directive] visitor since the page was created in Sept. 2002. This page was last updated Sunday, 16-Oct-2016 18:40:02 EDT .